The chorus figure, Rhy. Fig. 1, is also heard in the intro. It’s played with distor­tion and composed of four barre chords; G, F#, Bm and Dsus2, and an open A chord. Note that the common barre chord shape used for G and F# major has the same fin­gering form as Bm. The change from F# to Bm merely requires transposing the shape to the next set of strings (Fig. 1). Most of the chords are strummed. The exception is Dsus2, which receives an arpeggiated treatment. Hold the chord form and pick out the individual tones in this repeating three-note pattern: 1st string, 2nd string, 3rd string (repeat). The main verse rhythm part, by con­trast, is played with a clean tone and fea­tures an arpeggiated chord approach. Similar voicings are used; Dsus2, A, F#, as well as an open G chord. A particularly nice touch is the hammer-on/pull-off sus­pension ornament on the open A chord. Here, fret the A chord as a barre with your index finger. This facilitates the move by allowing the second finger to hammer-on and pull-off over the barred shape [Fig. 2]. The interlude is metallic and crunchy. The chord changes are chromatic and eerie in this section with the progression E5-F#5-Fmaj7#11. Don’t let the name of that last chord intimidate you – it’s a common guitar voicing used by a score of guitarists from rocker Ed Van Halen to classical composer Heitor Villa-Lobos. The voicing is idiomatic to the guitar – the result of playing an F major chord (like a barre chord shape) with the open B and E strings [Fig. 3]. This is a great way to expand and add color to a common chord form. Experiment on your own with other versions of this idea in different positions. A few forms that work well are F# (2nd fret), A (5th fret), B (7th fret) and C (8th fret). Check ’em out. 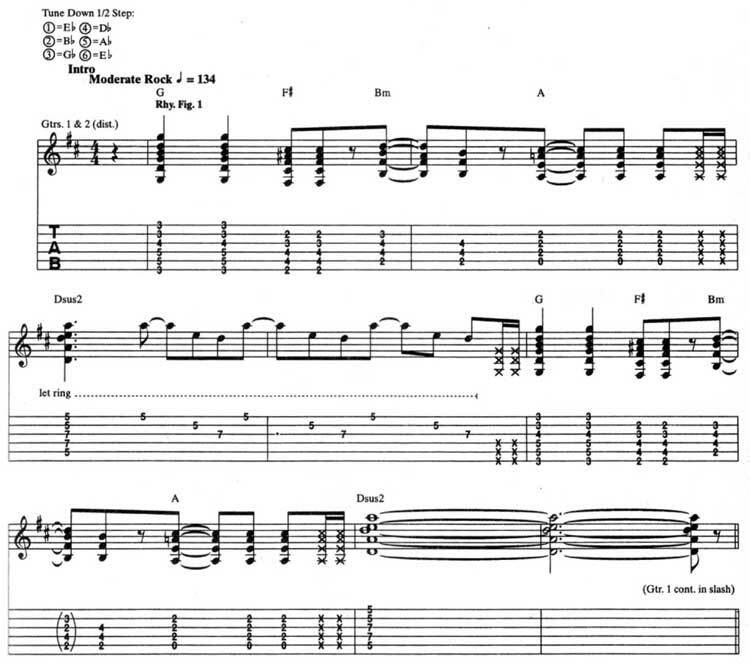 It’s a part of Live All Over You guitar tab and sheet. © 2012 - 2019 TabsClub Powered by TabsClub 42 queries in 0.467 seconds.